Mission:“The mission of EDU library is to foster the search for knowledge and provide comprehensive resources and also is to support the curriculum of East Delta University through its online and print collections. 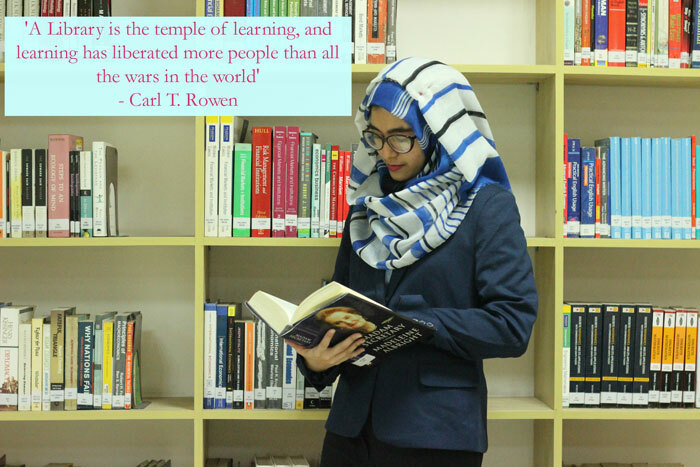 The library promotes intellectual growth and enriches the life of EDU community with knowledge by developing collections, facilitating access to information resources, teaching the effective use of information resources and offering research assistance. The students, faculty members, and staff of the university are invited to use the library’s online resources fully”. EDU library is to provide our users with the instruction that not only addresses how to access and use information resources but also how to critically reflect on the information retrieved. Vision:The EDU library is engaged in learning and discovery as essential participants in the educational community. We develop, organize, provide access to and preserve materials to meet the needs of present and future generations of students and scholars. We explore and implement innovative technologies and services to deliver information and scholarly resources conveniently to users. We create wholesome environments for study, teaching and research outside the classroom. Since the very inception, East Delta University held a firm belief that a university is as good as the library facility it offers. A promise to impart quality education remains merely a promise if the university fails to offer world-class library service to its staff and students. It is this conviction and philosophy that led to the creation of a state-of-the-art library in the university’s permanent campus. Surrounded by lush green mountains, the two-storey library will house over 50,000 books and a cozy seating arrangement, creating a one-of-a-kind reading experience for its avid users. As the Era of Digitization overpowers us – at a speed unsurpassed before, the digitization of books and evolution in reading habits among youngsters comes as no surprise. In such a situation, East Delta University understands the need to hold on to long-established traditional methods of knowledge dissemination while keeping pace with modernity and dynamism. The EDU Library is one such place where tradition meets technology in a very unique manner. With the perfect combination of real and virtual books, the EDU Library offers its students a wide range of books to choose from. While the e-resources allow its tech-friendly users to explore the infinite treasure of online journals, the traditional learner is equally stimulated by the enormous collection of books that the specially-crafted shelves hold in the library. From political science to literature to cosmology, one can find books of all variety in the EDU Library. The sole purpose of offering such a wide collection of books is to enrich the lives of its students just like EDU continuously propagates: Advancing Knowledge, Enriching Lives. No doubt, the EDU Library is nothing less than a place of sacred learning and knowledge-sharing, a place of mysticism. Before entering the library you have to entry your name on the register. There is a place for keeping your personal possessions excluding money and other valuables; otherwise, the university authority does not take responsibility for loss of or damage to the belongings. Personal possessions should not be allowed in the library, except exercise book, pen, geometry box and calculator. The library is a place for study; students’ behavior should reflect this and they should respect the study of others. Silence is the atmosphere of a library. Mobile phone should be switched off or in vibration mode in the library before entering the library and should not be used anywhere within the library premises. Writing or marking in books is forbidden. Any sort of mutilation will cause replacement. Do not reshelf or misplace any book. The library has a rich collection of printed books on Business Administration, Language, Literature, Social Science Studies, Science, Engineering & Technology etc. It has also various printed magazines and journals. EDU library subscribes a huge number of electronic resources covering almost all branches of human knowledge intended to promote scholarly and research activities order by the faculty members, students and staff of EDU. The library has access to thousands of full-text online journals; full-text e-books; online magazines /periodicals /newspapers and thousands of primary source documents and working papers. EDU library is in the process of collecting books from St. Cross College (University of Oxford) which is recognized as another milestone in its endeavor toward ‘advancing knowledge, enriching lives’. Reference materials include encyclopedias, dictionaries, almanacs, etc. 16 National and local Newspapers both in Bengali and English. EDU library is providing the following tools to assist students in organizing a reference or bibliography and guide through the research and writing process. Includes APA, Chicago, MLA, Harvard and Chicago. We offer Information Literacy Training for students, faculty members especially on online resources and citation style.